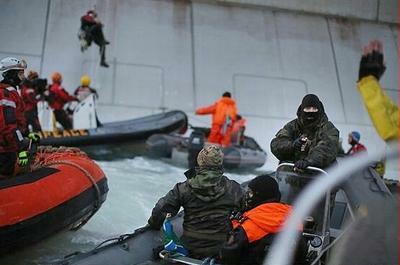 AMSTERDAM, The Netherlands, September 18, 2013 (ENS) – The Russian Coast Guard has fired shots at a Greenpeace International ship in the Russian Arctic and two Greenpeace activists were arrested today during a protest of oil drilling in the fragile, pristine environment. At 4.30 am Moscow time, five inflatable boats were launched from the Greenpeace International ship Arctic Sunrise and headed towards the Gazprom oil rig Prirazlomnaya in the remote Pechora sea. One of the inflatables was confronted by the Russian Coast Guard. Two activists who attached themselves to the oil platform have been arrested – Sini Saarela of Finland and Marco Weber from Switzerland. “Sini, who had managed to get back onto the rope was in a vulnerable position and Kruso who had made it up quite high was being pelted by the water cannons,” blogged Speziale on the Greenpeace International site. “Half an hour on and the guns were still being fired into the air and water. Sini and Kruso were still taking the brunt of the water cannons – it looked so heavy on their heads. After some time they decided they couldn’t go on any longer and started their descent. But the workers on the platform didn’t notice or didn’t listen — they carried on firing the water cannons at them and the Coast Guards started pulling their ropes so they’d land in their boat instead,” wrote Speziale. Crew members of the Arctic Sunrise reported that a total of 11 warning shots were fired across the ship and the Russian Coast Guard threatened to fire at the ship itself if it does not leave the area immediately. There are now no climbers remaining on the drilling platform, but the Greenpeace International icebreaker Arctic Sunrise remains in the area. In August 2012 Greenpeace activists including the organization’s executive director, Kumi Naidoo occupied the same drilling platform. Gazprom plans to start production from the Prirazlomnaya platform in the first quarter of 2014, raising the risk of an oil spill in an area that contains three nature reserves protected by Russian law. The company has signed a deal with Royal Dutch Shell to exploit Russia’s Arctic shelf. Although joint Shell-Gazprom drilling operations remain some years away, the partnership will expose Shell’s investors to the risks associated with Russia’s chaotic oil industry, says Greenpeace. Last month Russian authorities denied the icebreaker Arctic Sunrise permission to enter the Northern Sea Route to protest Arctic oil drilling. The ship entered the area regardless because he says the ship meets all required standards for ice class vessels. The Russian coast guard subsequently boarded the ship and ordered its captain to leave the area under the threat of preventative fire, leading the Dutch government, under whose flag the vessel sails, to demand an explanation.